Not everyone can be born with a perfect smile. In fact, most times the only way to get a perfect smile is to undergo cosmetic and restorative dental treatments. Our Redwood City, CA dentistry practice offers plenty of treatments that can help makeover your smile. When it comes to misshaped teeth, you could undergo orthodontic care and more invasive procedures. For minor cosmetic issues, porcelain veneers may be a more ideal solution. Let’s take a moment to discuss how these thin ceramic shells can be so helpful. If you have teeth that are misshaped, this can lead to a number of cosmetic and health issues. In terms of smile aesthetics, a misshaped teeth can cause your smile to look asymmetrical or uneven. This can lead to feelings of self-consciousness when you laugh, smile, or speak with others. In terms of dental health, misshaped teeth can lead to pain and discomfort when biting and chewing. There may also be issues with general tooth alignment, which can contribute to teeth grinding and even TMJ disorders. Porcelain veneers are thin shells of semi-translucent dental ceramic that are fixed to the fronts of the teeth. With porcelain veneers in place, the cosmetic flaws are completely masked from view. The versatility of porcelain veneers allow people to experience beautiful smiles if they suffer from various cosmetic flaws. Good candidates for porcelain veneers are people who suffer from misshaped teeth and other primarily aesthetic problems that impact their smile. If the patients suffer from dental health issues linked to their misshaped teeth, a different dental treatment would be more ideal. During the consultation process, we can go over all of the risks, benefits, and questions or concerns related to getting porcelain veneers. We can also recommend more suitable dental procedures if veneers are not an ideal treatment option for patients. During the porcelain veneers procedure, a small amount of tooth structure is carefully removed from the front of the misshaped tooth. This is to accommodate the veneer, and typically is less than 1mm. 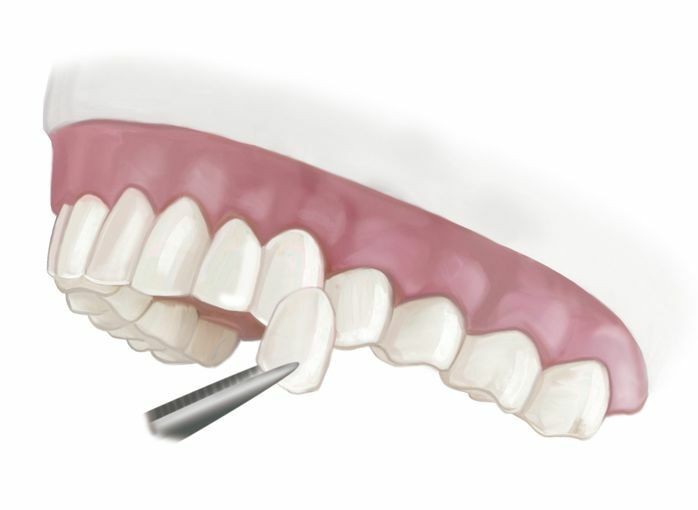 An impression is taken of the chipped tooth, from which the porcelain veneer will be crafted. When the porcelain veneer is ready, it will be securely adhered in place directly onto the surface of the tooth. Thanks to expert crafting, the porcelain veneer will fit seamlessly. The results of porcelain veneers treatment can be quite dramatic. Since the porcelain veneers blend seamlessly with your natural tooth structure, few people will notice that you have undergone any sort of cosmetic dentistry procedure. Patients can laugh, smile, bite, and chew normally. In general, porcelain veneers last about 10 years with proper oral hygiene and care. While durable, they will eventually break down due to the natural effects of wear and tear. Thankfully, porcelain veneers can be replaced. This procedure is essentially a repeat of the initial porcelain veneers procedure, with the new veneers lasting about 10 years as well. To learn more about porcelain veneers and how they can help you have a beautiful smile, be sure to contact an experienced cosmetic and restorative dentist. We look forward to your visit and discussing these matters in greater detail.